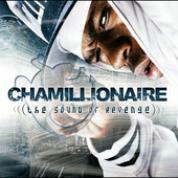 RapReviews.com Feature for November 22, 2005 - Chamillionaire's "The Sound of Revenge"
Not sober mind is a weak mind and he's buyin you a beer"
So me verse me, the only battle that y'all gonna get to see"
Hotter than a black pepper now that I am back niggah (he's back!)" Momma tellin you pay your tithes and you yell at her back "For what?" But soon as your buzz leaves, them problems come back around"
Chamillionaire is not the first out the South to come this real, and definitely not the last. Rather he's one in a long line of tradition who raps from the Dirty but often gets treated like dirt. This time Cham vows that things will be different and with "The Sound of Revenge" he may indeed reap what he sews. His hard deep voice suggest that revenge is a dish best served cold but in the end "The Sound of Revenge" will go down as one of the year's hottest albums.